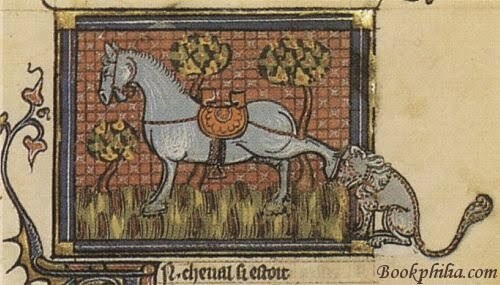 Bookphilia.com: T for Terrorist or H for Hero? 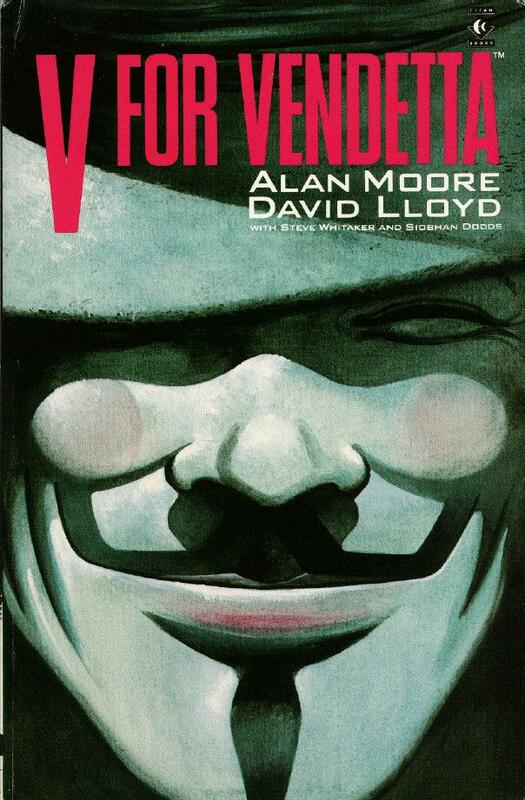 I'd been meaning to read V for Vendetta for a long time, mostly because a friend lent it to me and I hate being that guy - you know, that guy you lend books to who either takes ages to give them back or who never returns them at all. I sat on the damned thing for at least a year, and I would say that makes me officially guilty of one count of book neglect. However, I've already returned it so hopefully that somewhat mitigates my lameness. As for the reading experience...it was pretty good. But I have to admit to something shocking: I preferred the film to the original graphic novel. And the movie's not even entirely good; Natalie Portman is so completely disappeared just by Hugo Weaving's voice that the film is a bit of a disaster when she's on screen. But Hugo Weaving! He's never out of his crazy Guy Fawkes mask and yet he's so nuanced and compelling...which is what I think V in the book is supposed to be. And another thing. Having also read The Watchmen, which has Alan Moore in common with V for Vendetta, I am going to making a damning comparison: Moore is as unable to write female characters who aren't annoyingly 15-years- old-seeming as Guy Gavriel Kay is. They're all the same, and they're all whiny and immature teenagers, even when they're supposed to be in their 20s or 30s or 40s or older. They exist on only two registers: shrill and...okay, maybe just shrill. 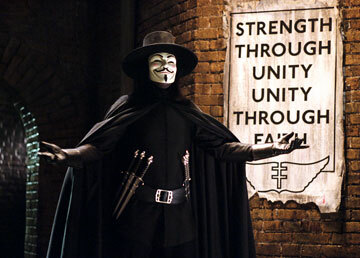 Poor female characterization aside, and capital E earnestness in V aside, V for Vendetta nonetheless says some very interesting - and frighteningly timely - things about how easily humans will allow their own, and especially others', freedoms to go out the window in exchange for "safety". The violent jingoism and localized racism, homophobia, and general intolerance to criticism which defines the dystopic England against which V rebels is horrifying; just as disturbing is how so many individuals who don't share the ruling party's hatreds still not only don't resist, but also actively participate in their vicious work because they either see no other option or fear the repercussions if they aren't seen to agree. Whatever V's "deviance" is - be it race, sexuality, or political affiliation - it is never revealed. The point, I guess, is that that shouldn't matter - that fighting for freedom is something that transcends all of these things. Yet, it also speaks to the fact that if we knew this about V, he wouldn't be capable of standing for freedom symbolically - because someone (reader and/or other character) would identify against him and dismiss what he stands for. He does wear the mask of a white man - Guy Fawkes - but a white man who's not only been dead 400 years, but who also died directly for his cause. V is a symbol using another, already established symbol to serve his purpose - and that purpose is to both transcend current definitions of the human so he may critique them, but also to establish historical precedent and validation for blowing up the symbols of those who oppress those who are different. Which leads me to what is, obviously, the most interesting thing about V: He is a terrorist, precisely in the way we would define it now, and yet everything he does is made to make sense in the context. Not easy sense, mind - except when Hugo Weaving is doing the talking and the blowing up, when it does. I'm surprised there was no great outcry about this, and yet maybe what it comes down to is a simple and horrifying failure to identify: By reading the comic or watching the film, we know precisely what V is resisting and can easily imagine that we would want to do something - potentially, anything - to change things, too. But when others, in situations we can't comprehend because we have no real insight into them, do the same things, we condemn them as monsters. So, while I didn't entirely either enjoy or admire V for Vendetta, I really appreciated Moore's insights into the less admirable aspects of human psychology - for that's what he's best at, I think. This movie was okay, but after seeing it I had no desire to read the graphic novel. I think there wasn't an uproar about the V character being both a terrorist and a freedom fighter because, for one thing, the point they were trying to make there was pretty obvious. I felt like if it had been more nuanced or subtle it would have had more of an impact. Subtlety has never been part of any aspect of the rhetoric surrounding what constitutes a terrorist and what a freedom fighter though - and there's been lots of uproar. Why would this be different? I both enjoyed and admired it. There was in fact a lot of discussion of the comic when it was first serialised ( my husband and I collected it in its DC serialised form) perhaps it's too long go for it to be remembered? Celine: You remind me that, in fact, I'm not really the person to be commenting on how popular/effective/etc a comic is, which is good. I am quite properly reminded of my limits. I'm glad to hear there was a lot of discussion of V for Vendetta when it was first released, because it definitely deserves it. And as the days since I've finished it go by, I'm coming to both admire and like it more and more - although I still stand by my assertion that Moore's characterization of women is generally lame. As for the film - yes, I'd say you're right about why people failed to engage - and yet, what *better* time to try to engage with these things than in a post-911/London train bombings world? Sigh. I've not seen the movie nor read the graphic novel but I'm with you on Hugo Weaving. I think any honest and thoughtful reaction to a piece of work is legitimate. You've every right to express an opinion on a graphic novel :)I enjoyed reading the review, and it's great to see an old classic getting the attention it deserves. I own the film and watched it recently. Weaving's portrayal really helped make the film a success. Someone had mentioned that a reader may get more from the novel if they're familiar with Britain's politics in the 80's, which I am not. The post-9/11 mentality, I get. V for Vendetta and the Watchmen are in my reading pile. Nice review and thanks for the shrill warning- too bad earplugs won't help.